Seema sent a good news during the holidays! She is accepted to Boston University under Early Decision. Congratulations! Thank you all & Happy New Year! So many things happened. Thank you, all. Good Bye, 2017! Jean-Ju wil give a seminar at Shanghai Ocean University, Shanghai, China and talk about studying abroad. We celebrate together Byoung-Il's B-day and Byoung-Il presents his future research plans. Jean-Ju share her experience of preparing job talk and interview for applying to academic job with Department post-doc fellows. 3:30 pm at SHM-B145. Komal updated a research progress in Bae lab. We also celebrated Jae's 2nd birthday in the lab! Manavi pre-views her poster presentation for SFN meeting next week at DC. Together with Michael Caplan and David Zanisek, Jean-Ju will visit Ritsumeikan University to introduce research interests and environment of Department and Yale School of Medicine. Delfina will have a practice talk for her MCGD rotation talk in the coming week. Go Delfina! Jean-Ju will share her experience of preparing CV, research and teaching statements for applying to academic job. 3:30 pm at SHM-B145. Jae will present his recent progress in research. We'll have Lily Cheng (1st year MCGD student) to join our lab meeting. Welcome, Lily! This is the last week for Buse in doing her summer research in Bae lab. Buse will give a short talk summarizing her research experience. Biology of Spermatozoa meeting initiated by Dr. Tim Birkhead. Derbyshire, UK, has a beautiful and peaceful fauna and flora. Interesting meeting focused on evolutionary and behavioral reproduction from plug formation to sperm competition. It's the 2nd Anniversary to the Chung lab at Yale! Seema has worked very hard during the summer and it's her debut for a short talk in the lab meeting! We'll also have Delfina, fresh G1 student who will rotate in the lab, to visit the lab and attend the meeting. Welcome to Yale and Chung lab, Delfina! Jae's turn to Journal Club! 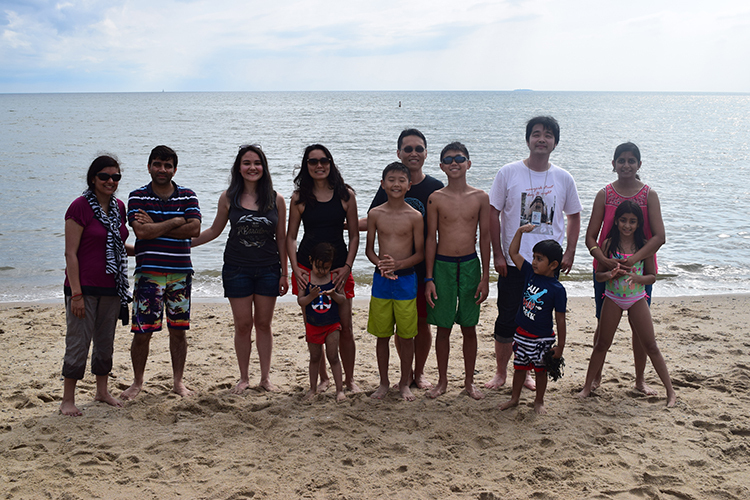 Chung-Bae lab summer picnic at Hammonasset Beach State Park. We met the whole families and had a great time!